(NaturalNews) We all know the difficulties associated with asthma such as, difficulty breathing, coughing and an inability to perform normal daily activities. Sadly, if you search the internet, conventional medicine wants you to believe there 'is no natural cure' for this dreadful condition. But, that's a lie - and I can prove it. Natural solutions for asthma DO exist. On the next NaturalNews Talk Hour, Jonathan Landsman and Teresa Fuller, M.D., Ph.D. will outline a comprehensive strategy designed to eliminate asthma - without the need for toxic drugs. This show will certainly improve the quality of your life. WebMD, the epitome of poor medical guidance, tells its readers, "Unfortunately, there is no cure for asthma at this point. In fact, it's highly advisable to avoid any asthma treatment or product - natural or otherwise - that claims to be a "cure" for asthma." Do they really believe what they're saying? And, more importantly, are they even taking the time to read the medical literature about asthma solutions? 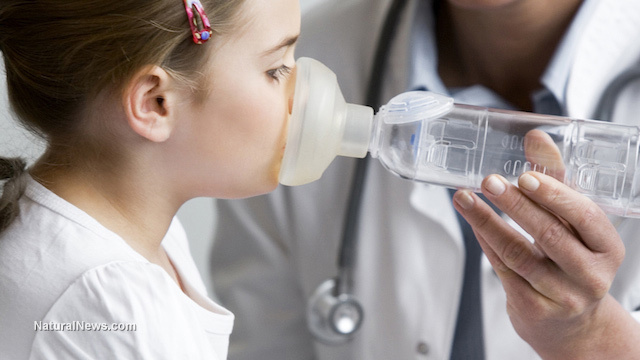 Western medicine, online, gives no hope for asthma patients. My advice is to stop reading pharmaceutically-driven, false propaganda and look carefully at credible science. For example, researchers at Children's National Medical Center have discovered that "African American children with asthma in metropolitan Washington, DC, are significantly more likely to have low levels of vitamin D than healthy African American children." Bottom line, get a proper vitamin D test - called 25-hydroxyvitamin D - and be sure to maintain optimal levels of 50-70 ng/ml. By the way, natural health experts suggest that cancer patients maintain levels between 70 and 100 ng/ml. Obviously, in acute situations - conventional asthma medications can be lifesaving. But, in the long term, bronchodilators and steroids tend to be toxic, addictive and more problematic. Thousands of people have freed themselves of asthma symptoms (naturally) by reducing their omega-6 intake; supplementing with high-quality omega-3s, vitamin C, D and eating a plant-based diet. On the next NaturalNews Talk Hour, Dr. Teresa Fuller offers great advice on how to naturally restore respiratory function. If your child suffers from asthma - don't miss this program. 1. Minimize your exposure to environmental toxins - indoors and outdoors. Avoid smoking areas or other toxic fumes, surround yourself (indoors) with lots of plants or use a high-quality air purification system. 2. Avoid processed foods. These foods tend to be loaded with too many omega-6 vegetable oils, sugars, toxic fats and excessive amounts of commercialized salt. Poor food quality promotes inflammation and makes it very difficult to breathe. 3. Stay away from factory-farmed meats and conventional dairy products. These foods are usually pasteurized, homogenized and loaded with unwanted additives such as, nitrites and sulfites - which lack nutrition and clog up the cardiorespiratory pathways. If you're tired of suffering with asthma symptoms - you're going to LOVE our next show with Dr. Teresa Fuller and Jonathan Landsman. Join us for an informative show. Teresa Fuller MD, PhD, is a holistic pediatrician at National Integrated Health Associates (NIHA) - serving the Washington D.C., Maryland and Virginia area. She is board-certified in pediatrics and integrative holistic medicine with a doctorate in physiology. This combination places Dr. Fuller in a unique position to positively impact the health of children by identifying the underlying contributors to disease such as nutrient deficiencies, toxicities, infections and other stressors in order to reverse symptoms and restore your child's health. Her focus is prevention of chronic illness and obesity in children and young adults, ADHD, asthma and allergies. Stop asthma naturally. Conventional treatments for asthma increase your risk of impaired growth, infections, cardiovascular disease and bone loss. Fortunately, with diet and lifestyle changes, you can avoid the serious complications associated with conventional drugs. Educate yourself, develop a plan of action and get started today. Visit: http://www.naturalhealth365.com and enter your email address for show details + FREE gifts!